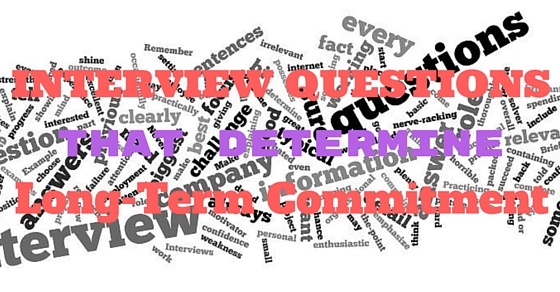 Interview questions, regardless of how it was conceptualized and how the interview was conducted, all have one ultimate goal – to assess the candidate’s core competencies and his long term commitment. The HR not only looks upon your qualifications and accomplishments; they also look for individuals who best suit the organization’s mission and vision. Aside from verbal questions, they may also require you to take aptitude tests to have a measure of your apprehension on certain criteria. While you may believe that you could easily get to top employers’ lists with your glaring degree and beaming job training, failing to impress them by giving ‘appropriate’ answers would put your chances of getting hired into great detriment. While most part of the job interview process focuses on qualifications assessment and salary bargaining, some questions are specifically designed to predict one’s tenure, commitment and loyalty. The impact of these long term commitment questions cannot be undermined, since employee loyalty plays a humongous role in predicting company’s sustainable success in the long run. In every aspect of life, gaining loyalty is important since you get people to stick with you through the good times and the bad. The same goes for established and up-and-coming business establishments; they need people who would dedicate time and enthusiasm towards adherence to their set of goals. Is this a trap? If the question appears to be too easy or basic, have a second thought before answering. Here are some interview questions built with the foundation of determining tenure and commitment. Why Did You Give Up On Your Last Job Too Quickly? This is a question that aims to unfold your previous work-related experience in your past work. It applies to aspiring employees who made a quick leap from one job to the next, who usually stayed for periods of 6 months or less. Employers also ask your reason for leaving, and if this type of occurrence happened in the past. Reasons that have something to do with health, personal life, moving out, and other work distortions are taken into serious account by your potent clients; they tend to be critical about it. These people want to eliminate the possibility of hiring a ‘job hopper’ which has continuously plagued various industries for years. If you were really forced to quit your past job due to an illness, having a medical certificate duly signed by a registered M.D. is a must. Back it up with a valid certificate of employment, and clearance to work slip from your trusted doctor to cast away uncertainties and doubts. If you were forced to move out last time, a duly signed document in the form of a tenant’s agreement, which proves you are really ‘in it’ for the particular location, would surely help. Of course, these documents only help you while they can; you must also solidify your worth by having concrete accomplishments, and uttering words of integrity. Phrases such as “I was able to accomplish these,” or “my short job-related training improved my skills on…” are desirable answers to shift your employer’s doubt of you staying to the positives you were able to secure from your past short stints. While a gap of a month or two is ideal, to give one ample time to search for his next job, a glaring gap of four months or more is considered to be relevant and impacting. This could be the most pressure-packed question you would be facing in a job interview, if you slacked off for some time. This question aims to reveal the very reason you stopped working – either because you lost the ‘indomitable spirit’ of working in your last job, or you just decided to doze off for months. For employers, answers to this question help them gauge your working patterns and your tendencies to skip or stop work. Utilize positive scripting and be straightforward. Like any other question, this one should be answered with absolute honesty – or not if you want to be dismissed later on. Remember that putting the blame on other people by using negative labels, such as your boss’ unprofessionalism or how your peers continuously managed to piss you off, give them the impression that you are ‘soft’ and have little to zero tolerance for undesirable working environments. Instead, focus on the positives which include professional trainings you undertook which improved your worth. Using replies such as “was able” and “made me more dynamic” are effective tools to boost your stock as a potential employee. Wouldn’t it be nice to furnish an athletic trainer certification from the University of Michigan? While other employers usually put this into a longer time frame of five years, a number of scholars believe that a two-year span is already a huge window of opportunity in itself. This question aims to unravel your future interest and affiliation with the company at hand; its answer should be in line with principles about career growth and sustainability. To put it into a much simpler context, you should show real intentions of staying and growing with the business organization. While you really cannot foresee the uncertain future, one could at least make good hopes for it. Having a specific course of action in terms of company standing, such as having that elegant title of ‘accounting manager’ or ‘senior auditor’ across your name within a specific time frame, would surely make better answers. Avoid using words such as “I hope to” or “I think.” The use of such words cast a cloud of doubt on the heads of your interviewers, making them think that you are only enticed with great remuneration for a short span. Be confident, but restrain yourself from making exaggerated forecasts. Some Tough Interview questions may be packaged in hard, mind-blowing ways. However, this should not keep you from excelling and effectively selling your skills and qualifications. At times, employers may pass on the best talent available; often deferring to individuals who exhibits desire to stay, grow, and learn with them. They may seldom show it through their actions, but most employers would want your talent to stay and grow with them. Every word you use makes for a different theme. It should effectively count. Impress while showing your genuine intent of staying. You will reap the benefits of loyalty and unparalleled performance as your career progresses. Joe Baldwin is a content writer and blogger at EssayLook.com, a site which specializes in delivering high-quality written content for various clients across the global platform.